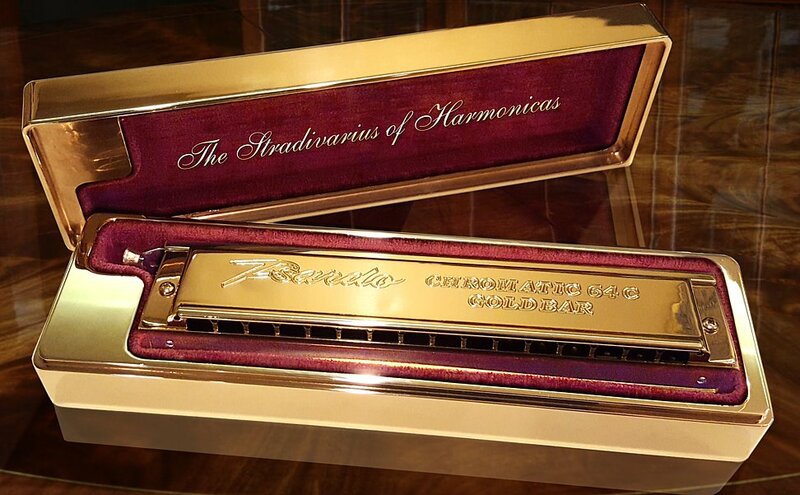 Philharmonicas was founded by businessman, inventor, and lifelong harmonica player Phil Sardo. His aim was to perfect the instrument he loved playing. After years of testing, tinkering, and prototyping, not to mention buying one of almost every harmonica ever made, he developed innovative designs that would profoundly change some of the most basic structures of the harmonica, producing unprecedented results in an instrument that had not significantly changed in over a century. 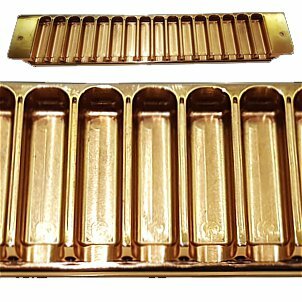 Philharmonicas' new patented comb, machined out of solid brass, provides airtight channels, directing the maximum air flow through the channel with virtually zero leakage. All internal corners have been rounded to prevent reflective distortion. This creates a smooth, continuous air path like those found in other traditional brass instruments. This is the first step in producing unprecedented tone and resonance without harmonic interference from other channels. The individual two-note reed plates are set into precision pockets in the body of the comb, laying flush with the surface so no air can escape from the edges of the plate and eliminating micro-vibrations. Each reed plate is then secured with two steel machine screws. 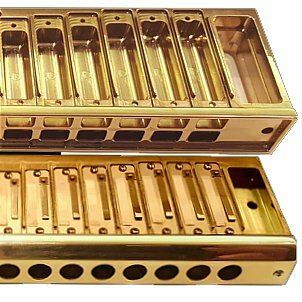 This design not only assures the air integrity of the comb-reed system but introduces the extraordinary ability to remove and replace individual reed plates for repair, custom tuning, or even changing the base key of the instrument. This can be done with one small screwdriver, saving the owner from costly and time-consuming professional service calls. Placed over the reeds, on either side of the comb, is a unique set of tubular channel covers. Snapped into place in slots between reed plates to continue the airtight environment of each channel, these patented air guides shape the sound waves produced by the vibrating reeds, preserving and reinforcing tone and volume. The combination of the smooth comb channels and the cylindrical cover tubes provides a continuous, sealed path for each note played. This is an important breakthrough in design because sound waves that create musical tones can combine with other sound waves resulting in a different sound than either of the original tones. By isolating the air channel of every note, the purity of the tone produced by each individual reed is preserved. Keeping all the air in a single channel maintains the full volume and tonal quality the of notes leaving the instrument. No part of the instrument was left unconsidered in the quest for tonal perfection. The mouthpiece is a solid, beveled brass part that rests on the edge of comb over the air channels. The round holes, smoothly machined for better and more comfortable tongue blocking, pass through the mouthpiece, widening out to match the larger openings of the channels in the comb. Set between the mouthpiece and comb sits the carbon steel slide. 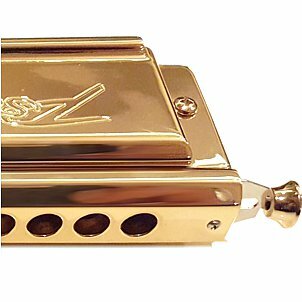 The slide is the only movable part of the harmonica, used to shift between sharps and flats and natural notes. This assembly is the first and one of the worse places where air can escape before it ever reaches the reeds. Normally, the slide is set flat on the flat edge of the comb and the mouthpiece is set flat on the slide with enough tolerance to allow the slide to slide. This allows air to leak out from eight different edges before entering comb channel. Our Chromatic 64 has a trench in the front of the comb to precisely match the dimensions of slide.The mouthpiece has raised edges around the base that interlock with the walls of the trench allowing slide movement while maintaining an air-tight an enclosure that minimizes leakage to an unprecedented degree. That brings us to the most revolutionary feature of this unique instrument; the individual two-note reed plate. Normally, all the reeds are riveted to one solid plate that is attached to the comb. Air can leak from all four edges. As a result, if only one of the reeds is damaged or warped, the entire plate must be replaced, usually by a professional. The Chromatic 64 utilizes two-note reed plates that are individually inset into the body of the comb to maintain airflow integrity and prevent buzzing and warping. They are held by two small, machine screws so as to be easily removed and replaced by the owner should one become corrupted in any way. This not only lowers the effort and cost of maintaining a perfect instrument but also opens up whole new possibilities. For example, multiple set of reeds can be kept to re-tune the instrument to other keys at will, custom note scales can be employed for a variety of ethnic musical genres, as well as any free tuning required for unique compositions or style of play. 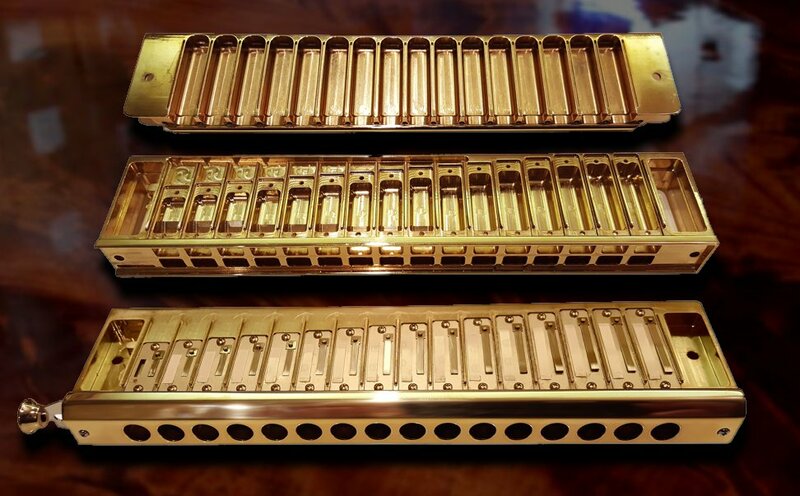 No other harmonica in the world can boast all the unique patented features and innovative design elements. 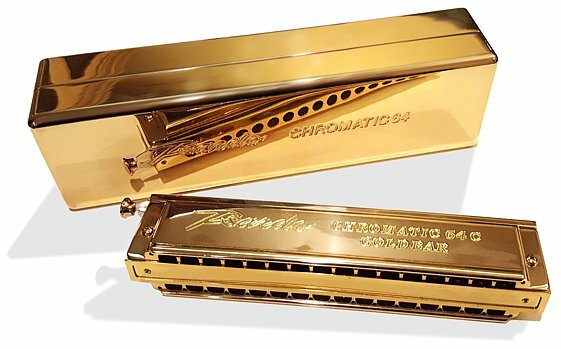 The richness of tone, the comfortable feel of the instrument, the unlimited scope of the tuning mechanism, and the quality and durability of the materials make this the one and only harmonica you will ever need. Easy maintenance and replaceable reed plates ensures that this instrument will be yours for long, long time.